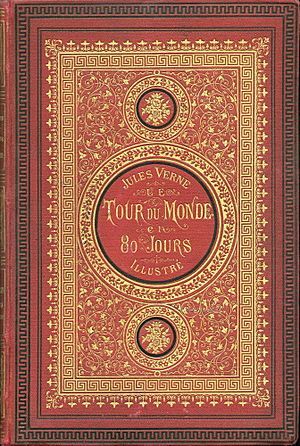 Around The World in Eighty Days is a classic adventure novel by Jules Verne. It was published in 1873. It is about a scientist Phileas Fogg. He and his new valet Passepartout go around the world in 80 days to win a 20,000 pounds wager made by his friends at the Reform Club. This book is one of Jules Verne's most famous works. Around the World in Eighty Days Facts for Kids. Kiddle Encyclopedia.